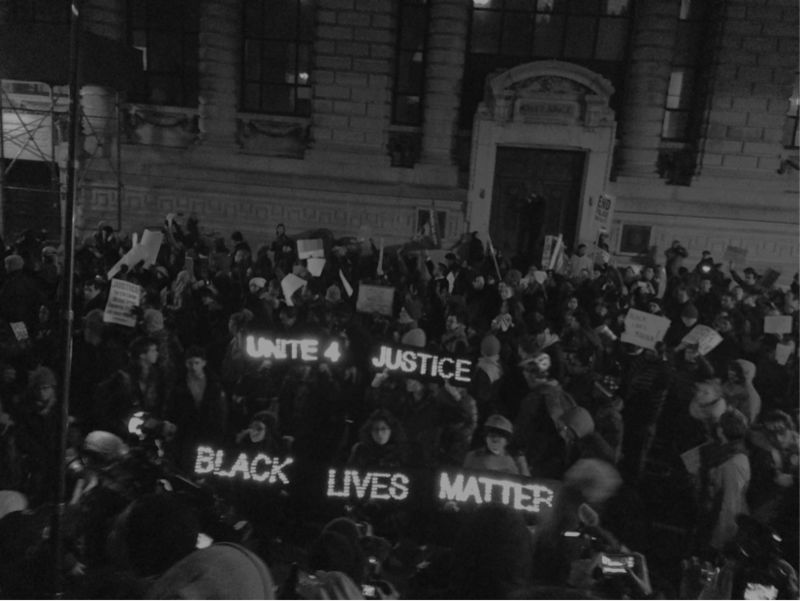 A scene from the Eric Garner protests in Lower Manhattan. Photo credit to Danya Levy, ’15. The day after the non-indictment decision in the Eric Garner case, around 5 P.M., people congregated across the streets of New York. BHSEC students mostly walked to Union Square, guided by fliers that had been passed around the school in previous hours and days. Some carried cardboard signs that had just been painted in the Art Room. On a corner of the square, a circle formed. More and more protesters trickled in, forming outer rings. At the center, people began chants and shared stories. One man shared personal memories of Eric Garner. Others talked about their encounters with the police, and the fears they held for family members and friends. A little after 5:30, the group started to march. The protesters stretched across several blocks, chanting and holding signs. “What do we want? JUSTICE! When do we want it? NOW!” “Black Lives Matter!” “The people united will never be defeated!” Protesters introduced themselves to those walking alongside them, and offered food and water. They also called each other out: when a white man yelled over a black man who was giving a speech, another protester quickly told him not to speak over black or brown voices. As the protesters marched, passersby stopped and stared. iPhones were raised, selfies snapped. Some joined. Others stood alongside the flow of people, raising their hands into the “Hands Up Don’t Shoot” gesture. Cars honked. Residents gazed down from windows. Eventually, the protest reached Foley Square. Massive groups joined together from different directions. Near the entrance to the bridge, the crowd stalled, unsure of where to go. People stood up on benches and climbed up lampposts to survey the crowds. It was unclear if the bridge was blocked or not, and there was confusion as to where the protest should go. After a bit, in one section of the square, people began to yell: “Broadway! Go to Broadway!” The chant spread, and the crowd moved. People went off in different directions: some did end up going across the bridge, or elsewhere. But many went up Broadway. Groups of people walked up the street, past stranded cars, on the sidewalk. Some drivers honked in solidarity; others looked annoyed. At one point, I walked up a large set of stairs to view the crowds from above. I had been marching towards the end of the protest group walking up Broadway. Even so, I watched the crowds stream by for ten minutes. Step by step, protesters walked uptown, chanting, singing, as did others all over our city. The message was clear: Black Lives Matter.